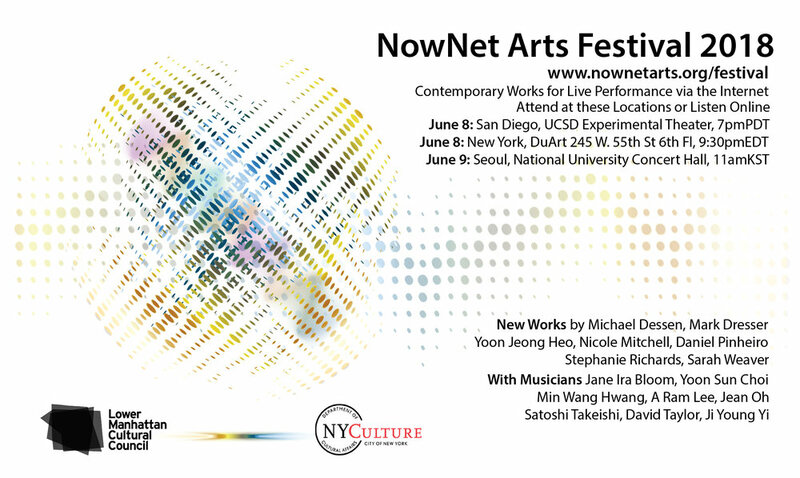 NowNet Arts Festival premieres contemporary works for live performance via the internet. The program featured internet artist Daniel Pinheiro streaming from Portugal, and “Interconnections for Peace: A Telematic Concert in Seoul, San Diego, and New York City” with compositions by Michael Dessen, Mark Dresser, Yoon Jeong Heo, Nicole Mitchell, Stephanie Richards, and Sarah Weaver for an international large ensemble. The technology incorporated performance-quality multichannel audio and video conferencing on high-bandwidth internet. Audiences were present in each location and online via webstream. A participatory networked experiment between two remote locations, Portugal and U.S., as part of the NowNet Arts Festival 2018. "i-mediate(d) body" aims at investigating the possibilities of the Internet as an aggregatory space where bodies are called to complement each other. Connecting directly with the audience attending the festival, remotely – broadcasting via a video-conferencing platform – it asks of participants to complement the artist body, or parts of it… a visual setup that depicts the electronic connective tissue that builds the space of the Internet as whole, through combining our interactions within it. can we be one, while connected\together? Perhaps there is nothing more musically disembodied than a telematic music performance in the sense that the medium is a virtual shared space. Yet a telematic performance takes so much planning and determination, that the result can be extraordinarily intimate, due to its hybrid nature, even more than traditional performance. The title of this piece, though a pun on the jazz standard, “Body and Soul,” has a projection of intent for peace in Korea. The piece serves several musical agendas; it both celebrates our distance by highlighting the individual musicians and locations, and then slowly joins the three locations in cascading duets and trios. Eventually three planes of tempo between the three locations becomes the backdrop for a theme that is introduced, phrase by phrase, city by city, and then re-performed in a three city heterophonic augmentation, celebrating distance, delay, congruence, and diversity of theme and intent. Reflecting on telematic music concepts for peace amidst current events led me to compositional ideas on roots of oppression within totalitarianism. Personally I encountered related ideas last summer when I had Bell's Palsy, a temporary paralysis on one side of the face. At the time I read philosophical concepts about paralysis as liberation, as a means to overcome itself, as a meditation on borders, as a crossroad between totality and infinity, and with infinity as a breach of totality. Totality as paralysis resonated on many real and metaphorical levels. The piece "Transforming Totality" is about the breach of totality, transforming into authentic evolving realities for peace. Musically the telematic medium is appropriate as a new model that transcends local reality into a multiplicity state. The piece includes devices such as harmonic transformations, time progressions of pauses and continuations, vibrato as transforming agent, extensions and timbral shifts, compound textures and alignments, spatial explorations, and abstract planes for emergence synthesis. Together with the intuitive processes of performance, "Transforming Totality" is intended to manifest this real and metaphorical transformation. This piece is music about DMZ. We have been staring each other for a long time in this distance and the world looked at us. There is only irony and peace in this DMZ. Birds and beasts, rivers exist and one of the most unspoiled lands in Korea. The peaceful space outside the DMZ is not so peaceful. But we have good opportunity these days, so our dreams come close. This composition is somewhere between a song and a sonic bath, and features densely overlapping expressions across 3 sites and ensembles. The harmonies, melodies and rhythms were composed with the latency of this specific event in mind: The delay across the sites is high enough to be perceived as a tactile reminder of the distance between us, but is also low enough that (along with what we hope will be high-resolution sound quality) we can feel a shared macropulse and vibrational unity within the co-located ensemble. The music is a meditation on peace, the theme of tonight’s concert, and the title is derived from 2 important recordings that influenced me in different ways as I composed it: What Reason Could I Give, by Ornette Coleman, from the album Science Fiction, and Peace on Earth, a work that John Coltrane recorded live in Japan toward the end of his life. Thank you for listening. This piece aims to elaborate upon the inherent differences of sonic environments between the locations of Seoul, South Korea, New York City, NY and San Diego, CA. While each location experiences their own sense of time, space and sound, it is the ability to mitigate these divergences and create a mutually coherent and meaningful musical dialogue across vast physical distances that I find most remarkable. This piece aims to highlight and embrace these variances of time lapse and sonic location with three musical sections that are rhythmically and harmonically interchangeable, staggered and layered such that each location functions within their own "orbit", circling independently within a greater universe of sound.